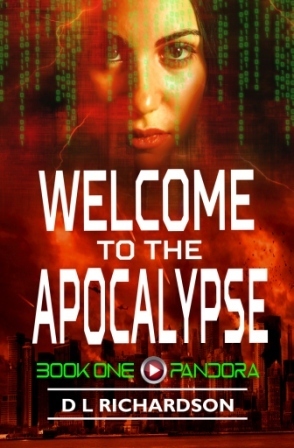 Welcome to the Apocalypse (Pandora, #1) by D L Richardson keep me reading right to the end. Kelly Lawrence, a grieving widow enters the deep virtual reality game in hope of finding some facsimile of her dead husband who helped build the game. Her brother, Jack Minnow comes along to watch out for Kelly (or on 'suicide watch' as she terms it) while his business partner Reis Anderson (handsome, rich and scarred) is roped in to test the game for their clients. The Apocalypse Games introduces a range of potential human extinction events - from Zombies, to Aliens, to Plague or homicidal Clowns. It is only meant to last 24 hours, too much longer might endanger the players ensconced in their pods, but something goes drastically wrong and the Kelly, Jack, Reis and the other players are trapped in the game indefinitely. Will they be able to escape and what will they find when they do. For me Richardson keep the plot moving with interesting scenarios - both with the elements of the game, the evolving computer AI (Pandora) and NPC players and especially with the personal and emotional dramas of Kelly, Jack and Reis as they face the nightmares in their past and work out they really want and who they really are. Though the ending was a bit sudden I really enjoyed the read and look forward to reading then next in the series. Sign into Goodreads to see if any of your friends have read Welcome to the Apocalypse.